Hob was released 4 days ago and we have had time to play the game for a bit more than 3 hours. The makers of the Torchlight series have done an excellent job when creating this new action/adventure game mixing exploration, combat and platforming elements. The only problem is that, just like Forza Motorsport 7, it can run pretty terribly depending on your computer. In our experience, the game stutters pretty badly at times, with frame drops down to 30 fps, even with a GTX 1080. When everything runs smoothly, it's really a perfectly recommendable title for those who like the genre, but as it is now, we can only advise you to wait until the problems are fixed. Hopefully, it will happen before October 10, as gog.com is offering Stories: The Path of Destinies and a 3€ credit on your account if you purchase the game. Note: We chose not to show the most severe drops in our videos because we like the game and we think it is worth your money - provided the stutter is addressed soon. Excellent game! Just like Torchlight 1 and 2. I finished it yesterday - with both endings. Performance was great for me, but I've seen many people complaining on the Steam forums about it. Guess I got lucky. The only thing Runic Games needs to add in a enhanced edition or - hopefully - sequel would be a way to keep track of missed upgrades. Or at least the inside buildings' entrances and exits, so you don't have to wander the map aimlessly searching for them. Drift, I hope you stick with it till the end, it's an excellent game indeed and it's around 6-12 hours, depending on how much you backtrack for upgrades and are stuck - since the game allows you to choose what to do and in which order to do it without holding your hand. PS. My only suggestion would be to play it at the hardest difficulty setting, because even without using all the powers - I didn't look on how to use them till 2/3 of the game - and with an outfit that reduced both health and energy in exchange for movement speed, the game was still easy. Once you have many abilities - and use them, you're basically unstoppable. I'll wait until they patch it, sometimes the stuttering is really annoying. I completely understand, when games stutter, it's absolutely annoying indeed. I stopped playing Watch Dogs 1 on PC and went to play the X360 version because of that issue. Anyway, I hope that when you finally get to play it, that you enjoy it as much as I did. Zelda, you say? ... might need to play this. 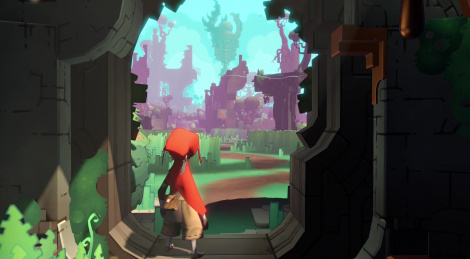 Hob feels like a homage to The Legend of Zelda and Metroidvania games, but with a few improvements of its own. Of course, most TLoZ games are better, but Hob is still an excellent game. this looks excellent. i'll definitely pick it up at some point.